The Singer 7258 is a sewing machine that has a huge amount of built-in stitches. It is a very user-friendly sewing machine and is a perfect first machine that will see you right through your sewing journey. The Singer brand has been famously known for their well-functioning sewing machines since back in their early days in 1985. The brand is now officially known as Singer Corporation, however, they were previously named Singer Manufacturing Company and originally originated from New York. Singer, aims to help users to express themselves, and their personalities, through the use of their sewing machines, such as the Singer 7258. With Singer’s exceptionally crafted sewing machines, sewests worldwide are able to create to their hearts' desire and share the things they love with their loved ones. Singer sewing machines are built innovatively and are practical to use. This is because the brand takes pride in making their technology user-friendly for the masses. Is The Singer 7258 Easy to Use? The Singer company was originally started in 1850 when Isaac Singer invented the world's first practical sewing machine. It wasn’t until 1851, when he got a patent for that sewing machine, that the name Singer became so synonymous with sewing. Since then the company has been intertwined in the industry. This seemed to have marked the beginning for the company and they’ve remained a leader in the industry since then. The company's innovative spirit seems to go hand in hand with firsts, as the company has progressed it has seen quite a few world firsts. This includes not only the world's first electronic sewing machines and the world's first zig-zag machine, but also the world's first sewing assistant app for mobile devices, not to mention quite a few other firsts. Singer seems to be not only a practical company but a creative and innovative one that strives to be a leader in the sewing industry world wide. They are a truly respected brand that is passionate about inspiring sewers of all levels everywhere. 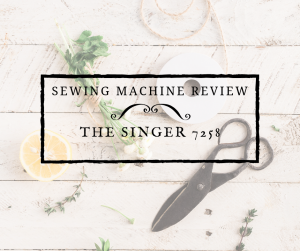 The Singer Stylist 7258 sewing machine is an incredibly innovative and superior piece of machinery. With an unbelievable amount of stitch options (100 in total), this machine is a mid-range Singer model that allows anybody to use it with complete and utter ease. Many electrical sewing machines out on the market cost twice the price of the Stylist 7258 sewing machine, yet have less than half of this sewing machine's capabilities. The outstanding features of the Singer 7258 would definitely be the fact that it allows for 100 different stitch options. That means that this sewing machine will provide users with a seemingly unlimited amount of creative possibilities! The Singer 7258 comes with 100 stitch options, 10 presser feet, an LCD display screen, and much more. This sewing machines LCD screen completely revolutionizes your sewing experience! It helps display all sorts of useful information that you never knew you needed. For example, it displays the stitch that you're currently using and also allows you to tailor the stitch settings to your liking; you can select the length and width that you wish to use. Lets get into the specifics of the Singer 7258! LCD Screen: The inclusion of this LCD screen allows the user to determine the exact length and width of the stitches. This make sewing a lot easier, especially for sewing novices! With this feature, users will be able to control the speed better and change the stitches a lot easier. However, sewing experts will also thoroughly enjoy the existence of this feature—who doesn't want to make their sewing experience just that tiny bit easier? With this LCD screen, users can also select speed options without the need of a foot pedal. This is incredibly useful, as some people aren't completely comfortable with using a foot pedal. The LCD’s display screen is simple, completely colourless and does not have a backlight. But it does the job. Darning Plate: Darning is considered to be a sewing method for mending whatever material you're working with. A lot of people choose to use a sewing machine to complete this action, as it makes this process a lot quicker. Instead of the Stylist 7258 coming with adjustable feed dogs, the darning plate that comes with this sewing machine does the exact same job. Slide the darning plate into place, just over the area where you feed the cloth through, when you're completing free motion work or free motion darning. This will ensure that whatever material that you're working with will remain in place as you sew. Free Arm: The free arm feature of a sewing machine allows sewing machine users to freely work on projects, such as sewing trousers, sleeves and other cylindrical projects, without much trouble at all. With this free arm feature so readily available on the Singer Stylist 7258 sewing machine, all the user needs to do is removes the storage compartment located at the bottom of the machine. This will then allow the user to access the free arm feature on this sewing machine. Built-In Needle Threader: Nobody likes to take the time to manually thread sewing needles. It's often incredibly difficult to do and can often make sewing a tiring and laborious experience. It is also not very good for your eye health, as it often requires intense hand-eye coordination and also forces you to strain your eyes while doing it. To use this feature, all you need to do is hook your thread into the thread guide—which is located near the needle of the machine. Then pull down the lever while still holding onto the end of the thread. Continue to rotate the lever to the back of the machine and move the thread through the hook, before pulling it upwards. Finish off by returning the lever back to its original position, you will see that the thread will be threaded through the needle by itself. Finally, just release the lever and pull the thread away from you. With this, you're done and you can begin to sew away! No stress and eye strain for you! Setting up the 7258 isn't at all difficult. The instruction manual (which comes in the box or you can find it on the Singer website) sets out the clear instructions on how this sewing machine should be put together. It has very easy-to-follow instructions on how to install every single part of the machine and even tells you, in detail, how to thread the needle or how to insert the bobbin. Of course, it would be wise to think of a location for it in your home before you consider purchasing it. The Singer Stylist 7258 sewing machine contains many features which ensure that it is, overall, easy to use. Due to this, there's no wonder why the 7258 is an excellent choice of sewing machine for both sewing novices as well as experts. It doesn't matter what sewing level you're at, this sewing machine will definitely ensure that your sewing experience is stress-free and 100% enjoyable. So, feel free to sew and create to your heart's desire. The Push Button Stitch Selection feature keeps things simple and allows you to pick your desired stitch, with just the simple press of a button. It allows you to select the exact length and width of your stitch and the best part is that you get to select everything so easily! And if you like to be really specific with your selections, you can even select the specific tension of your thread. However, whilst this feature is easy to use, it does get a little tedious to select the stitch as the number increases. For example, to select stitch 60, you'll have to press the arrow 60 times to get to your desired stitch. This isn't to say that it is difficult to control, it just requires a little patience. However, if you're sticking to stitches 1 to 20, it's a breeze to select it via pressing the button. The LCD screen that is built into the 7258 sewing machine is simple and useful. It is easy to read and understand what is going on with your sewing machine. The combination of having the LCD screen directly located above the display of all of the machine's possible stitch options, really allows the user to easily select what they want, without any sort of fuss. To select the desired stitch, all user has to do is either press the button up or down and you can easily see which stitch you are currently on, through the handy LCD screen. The Singer Stylist 7258 comes with 10 easily interchangeable presser feet. These 10 presser feet would include a zipper foot, a satin stitch foot, a buttonhole foot and much, much more! Installing or changing the presser foot is incredibly easy to do, and you can easily complete this action in 3 easy steps. First, push the presser foot release lever to remove the pre-installed foot. Next, place your foot of choice on the needle plate and align the presser foot holder to the foot holder. Lastly, just lower the presser foot lifter and the foot holder will snap on to the interchangeable foot. The Singer Stylist 7258 sewing machine does come with a sewing foot pedal; however, the foot pedal does seem to have some issues. It isn't very durable and does tend to break easily. However, this sewing machine doesn't require a foot pedal for it to function properly. This is because the 7258 does come with an off and on push button sewing option. This way, the users don't need to use a foot pedal to control the speed of their stitch. Though I always think using a foot pedal is always the best option.The sensitivity of the foot pedal is reasonable and fairly easy to get accustomed to. The harder you press on the foot pedal, the faster the stitch will go. The interior of the Singer 7258 sewing machine is made out of a heavy-duty metal frame and this makes it a heavy duty and long-lasting sewing machine. With its in-built sturdy frame, you won't have to worry about it breaking down from working too hard. This machine is sure to last you for years and years with general everyday use! In terms of transport, the sewing machine only weighs approximately 6.7 kilograms— considering that it is fairly lightweight for a heavy-duty sewing machine - you should easily be able to transport it without any difficulty. Despite being lightweight and relatively easy to carry, it still isn't completely advisable for you to constantly transport this sewing machine from one place to the next, as the machine will still get damaged if you drop it from a height. Considering that the Singer 7258 is built with a heavy-duty frame, it can handle the everyday knocks and bumps, with no problem whatsoever! The Singer Stylist 7258 is considered to be relatively noisy compared to other sewing machines out on the market. It should probably only be reserved for daytime use, as it may cause members of your household to wake up in the middle of the night - if you do decide to use this sewing machine in the middle of the night. Unfortunately, if you do decide to use this sewing machine whilst watching television or listening to music, you might have to dial the volume of your entertainment source a little. Whilst the noise is far from unbearable, the noise produced by the 7258 isn't exactly the most quiet unit. The thread tension of your machine is incredibly important. Sewists like to avoid threads breaking, its an annoying and avoidable issue. If the tension in your thread is too tight, the thread might break or the stitch may not come out right. However, if there isn't enough tension, your stitch won't be as strong and it'll come out rather loose. Hence, it is very important that you make sure that your thread is of the right tension as you sew. The required tension is also different depending on what you're working on. Different projects involving different material will greatly alter the required tension. Manually adjusting the tread tension can get quite tedious— having to alter the tension all the time - and who's to say that you're even doing it properly. A great advantage to the Singer Stylist 7258 sewing machine is its built in self-adjusting or automatic tension system! This means that it will automatically configure the required thread tension for you, and you don't have to waste time stressing over it! This sewing machine will alter the thread tension according to your selected stitch. So, all you have to do is turn the dial to your desired stitch option for our project and the Singer 7258 will change the thread tension to suit it. The Singer Stylist 7258 sewing machine's warranty is split up into three different groups and different parts of the sewing machine are covered by different warranty terms. However, overall, the Stylist 7258 sewing machine has a limited warranty of 25 years. Something to remember is you will only be able to claim warranty if it has only been used for household purposes. All in all, the Singer Stylist 7258 sewing machine is great for sewing novices as well as sewing experts. With an incredible selection of 100 stitching options, there's honestly no reason why this sewing machine shouldn't be considered for purchase. With that many stitch options, users will be able to create to their heart’s desires! Too many stitches? Maybe, but can you ever have to many options? The Stylist 7258 sewing machine is selling for slightly under $300. I feel at this price, this high-quality Singer sewing machine is definitely a steal. The Stylist 7258 not only comes with 100 stitch options, but it also has an easy to read LCD screen, a free arm feature and it even comes with 10 different presser feet. There are sewing machines which cost more than twice the current price of the Singer 7258 but have less than half of the features that this sewing machine offers. The LCD screen allows users to customise their stitching options more effectively and more easily. That's not all! The Singer Stylist 7258 also comes with an automatic needle threader. This allows sewing users to spend less time worrying about the boring stuff and spend more time on what they do best; sewing and creating!